Paris Saint-Germain officially opened the new season with the French Super Cup at Worthersee Stadion in Klagenfurt, Austria against Olympique Lyonnais on Saturday night. The Trophée des Champions match featured Ligue 1 champions and the winners of the Coupe the France as PSG fans finally got the chance to see their new team in competitive action under new head coach Unai Emery. The game in Austria was a perfect opportunity for the French champions to put down an early mark on their intention to dominate all domestic competitions once again. Les Parisiens went through with their intentions as the stomped over Bruno Genesio’s men to make it four consecutive titles. Tonight’s trophy was PSG’s fifth Super Cup title and the French champions are slowly nearing the most successful club in the competition – Lyon – who have eight Trophée des Champions next to their name. Following a compelling domestic season and more than 30-point margin in front of Ligue 1 runners-up (Lyon again), Paris Saint-Germain have proven that they intend to repeat their exploits and exert domestic dominance with one eye set on making a step forward at the international scene. After three successful years at Sevilla, the 44-year-old Spanish tactician was enticed by Paris Saint-Germain’s project and decided to change clubs as he succeeded Laurent Blanc at the helm of the French champions. 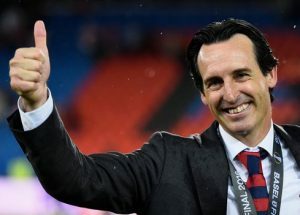 Emery lead Sevilla to three successive Europa League titles and arrives to France with solid credentials and high expectations. Fans are hoping that Emery will help their club make a noteworthy results in Europe having in mind his vast experience at the international scene and an opportunity to be in charge of such great club like PSG presents a personal challenge for Emery as well. I am sure that he will be great success with Les Parisiens and that he will be able to continue PSG’s dominance. Two South American players seem to be extremely pleased with the managerial change as they relish the opportunity to prove their worth to the new boss Unai Emery. The Spaniard has shown openness to explore every option at his disposal and Javier Pastore, Lucas Moura, together with indisposed Serge Aurier played a significant part in tonight’s victory over Lyon. The 27-year-old Argentina midfielder Pastore scored a brace to round off an impressive display, while he also had a couple of more chances to increase his tally. His impressive showing is a good sign of things to come as the Argentinean hopes to be more involved than last season. Only 16 Ligue 1 appearances and two goals last term for a player of his calibre was simply insufficient for a player who was brought in 2011/12 as the first high-profile signing for the French giants as they began their new project. Lucas Moura was more involved last term having played 36 games, 26 of which were starts. With Zlatan Ibrahimovic gone and Edinson Cavani expected to be pushed in the middle of attack, both Pastore and Moura could be given a more important role under new manager. A new era began tonight for Paris Saint-Germain as Zlatan Ibrahimovic prepares for his own first competitive match with Manchester United. Swedish powerhouse helped Paris Saint-Germain restore their cult status in France and across Europe and PSG will struggle to find an equally charismatic and influential replacement for Zlatan Ibrahimovic. Still, in terms of team performance, Ibra will not be sorely missed at PSG. Edinson Cavani is expected to be given more breathing space, while the entire attack force will not be more equally distributed across the flanks and middle of the attack. Emery revealed that his activities in the transfer market are still not over and that fans could expect to see an addition to the forward line. We bet the supporters are all excited to see who could be added to a star-studded squad – most likely Real Madrid’s Jese. Lyon striker only played 45 minutes in what has been a generally woeful performance from the Ligue 1 outfit. French striker has had two highly successful seasons with his club having scored 54 goals in Ligue 1 and his fine performances have alerted the likes of Arsenal, who are pushing hard to lure the Frenchman to the Emirates. The 25-year-old striker was not his usual self tonight with only one good chance on PSG’s goal for the 45 minutes he spent on the pitch. His overall performance was not up to the expected level and it was apparent that French star is distracted by the ongoing transfer rumours. Arsenal have reportedly opened negotiations with Lyon over a £29 million deal and Lacazette could be on his way out of the club in the following weeks. Unused subs: Areola, Augustin, Ikone, Matuidi. Unused subs: Gorgelin, Aouar, Diakhaby, Grenier.